At the start of this series when I wrote about the Malaysian obsession with food, I mentioned that some street food vendors have been able to send their children overseas to study. This happens in my debut novel, The Woman Who Breathed Two Worlds. In reviews of the book, at least one American reader has expressed scepticism over such an outcome. But in Malaysia it is perfectly possible for street vendors to become wealthy. To understand why, you have to appreciate the role of food for us. It serves as balm and salve, feeding not only our bodies but also our minds, and possibly even our souls. The above is not an understatement. Food is everywhere in Malaysia, permeating culture and consciousness in ways I’ve not seen in any of the other 60 countries I’ve been to. Part of this probably has to do with Malaysia being tropical. Colours and tastes seem somehow more vivid in the open-air than in a cold climate and you end up smelling food pretty much all the time. Walk down any street, something is sure to be frying. Avoiding food is impossible, and we all know what heavenly aromas do to our stomachs. 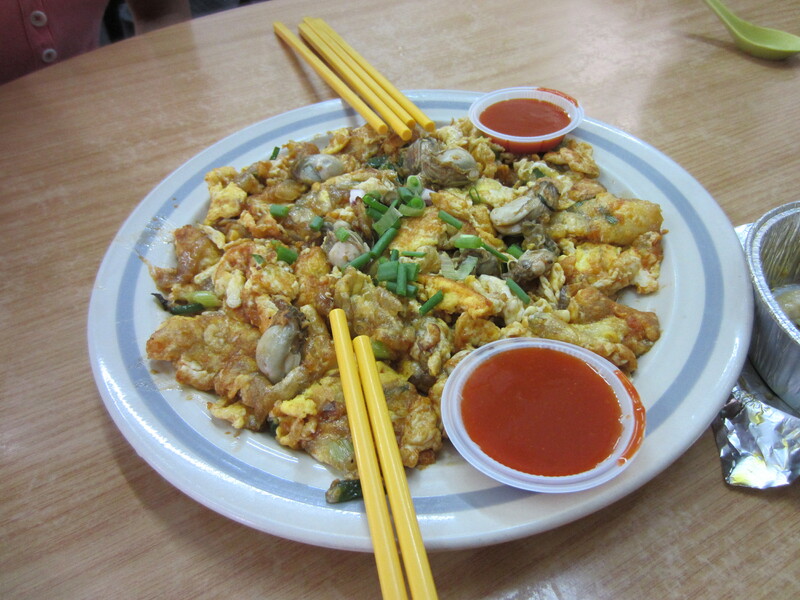 Oyster Omelette – Can’t You Smell It? Another part of the phenomenon has to do with the melting pot that is Malaysia. There are three main races – Malay, Chinese and Indian – each with its own distinctive cuisine. Food hawkers have therefore long had lots of competition; they’ve had to compete not just with each other but also with vendors of the other types of cuisine. Only the very best survive. The bar was raised from the outset; even foreign chains have to work harder. When I was a child, Kentucky Fried Chicken tasted very different in Malaysia than in the UK, for the simple reason that to entice customers, the Colonel’s chefs had to mix in local spices. The result was jazzed-up chicken that arrived crisp in baskets (instead of boxes). This led to great food overall and to a plethora of choice. The sheer scale of choice can be mind-boggling, as I mentioned in Ruminations on Food 2: A Malaysian Food Court. 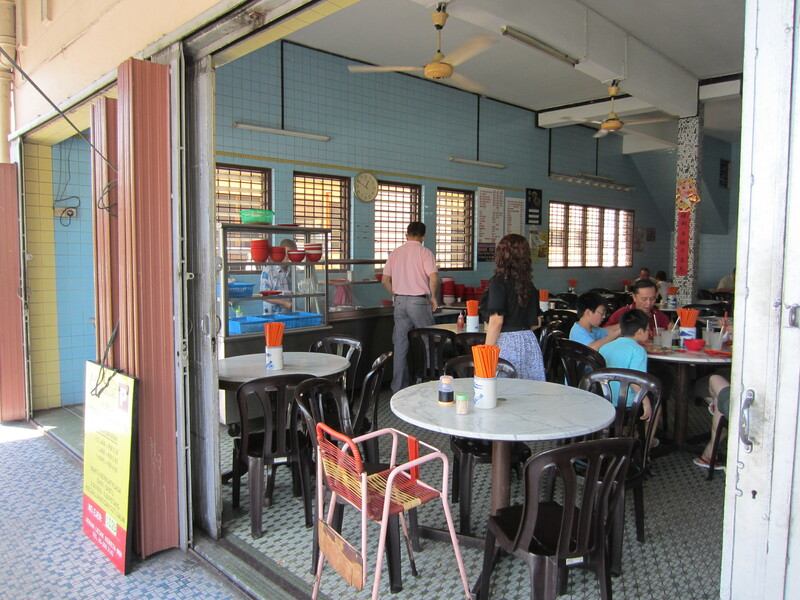 But Malaysia is also dotted with the other extreme: whole coffee shops dedicated to a single dish. 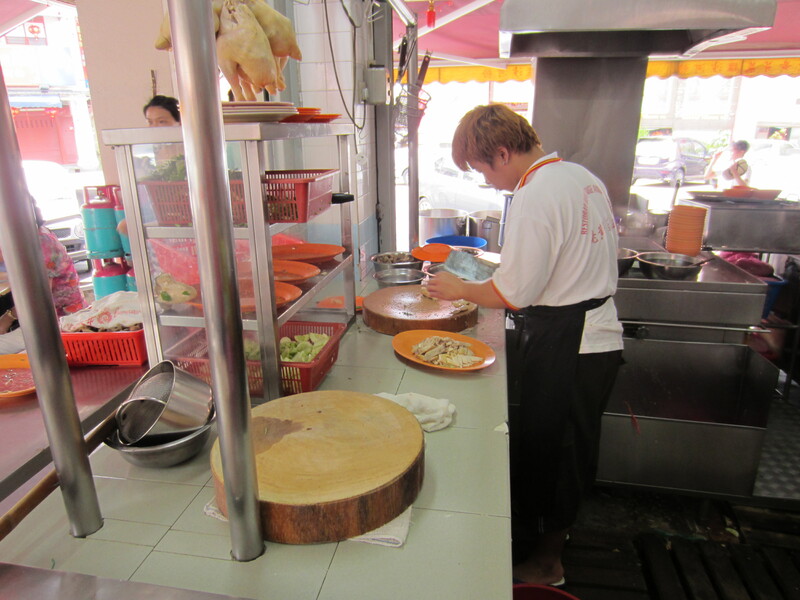 Many of the most successful food hawkers specialise in this way. There’s a good example opposite my old school in Ipoh. The coffee shop is called Yee Fatt, it’s been going since 1955 and it’s famous for curry noodles. Yes, you read right. 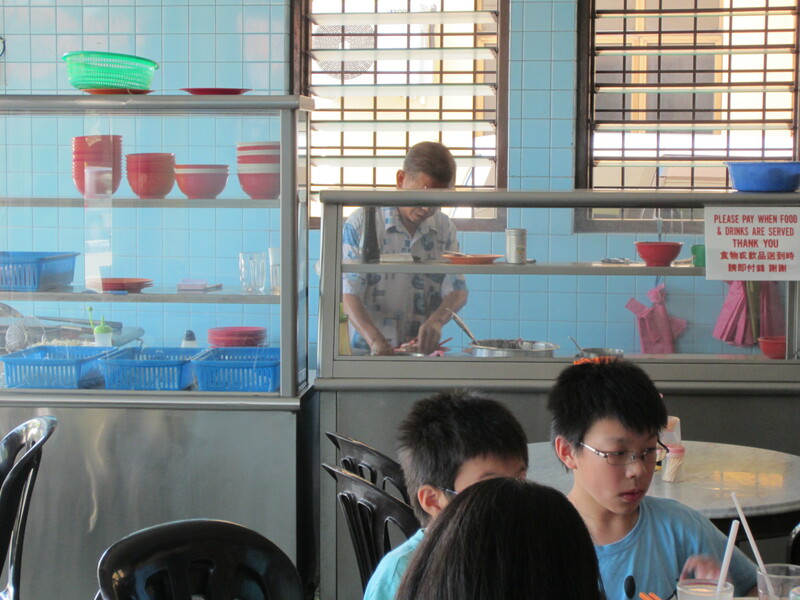 The place is known for curry noodles – not exactly a fancy dish. 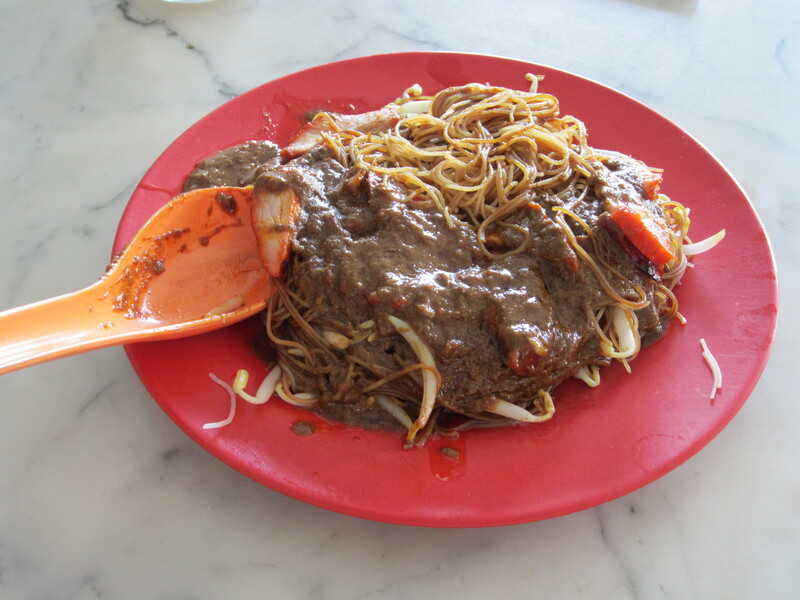 But the dish is so popular in Malaysia that it even has its own Wikipedia entry (as curry mee, which is what it’s also called). The boss at Yee Fatt is the middle-aged Chinese man in the picture below. What he’s doing behind the counter is blanching noodles and bean sprouts in hot water, lifting them on to plates, sprinkling barbecued pork over the top and then dousing it all in a thick curry sauce. He does this hour after hour, day in and day out, which may not sound like much of a life to some. But here’s the thing: the guy is his own boss. He opens early for breakfast, serves lunch and then closes his shop around three in the afternoon. That’s him done for the day! Afterwards he goes on a strenuous walk up Kledang Hill, one of many beautiful hills around Ipoh. We know because by the time we arrive at five, he’s well into his descent. Note Yee Fatt’s longevity. 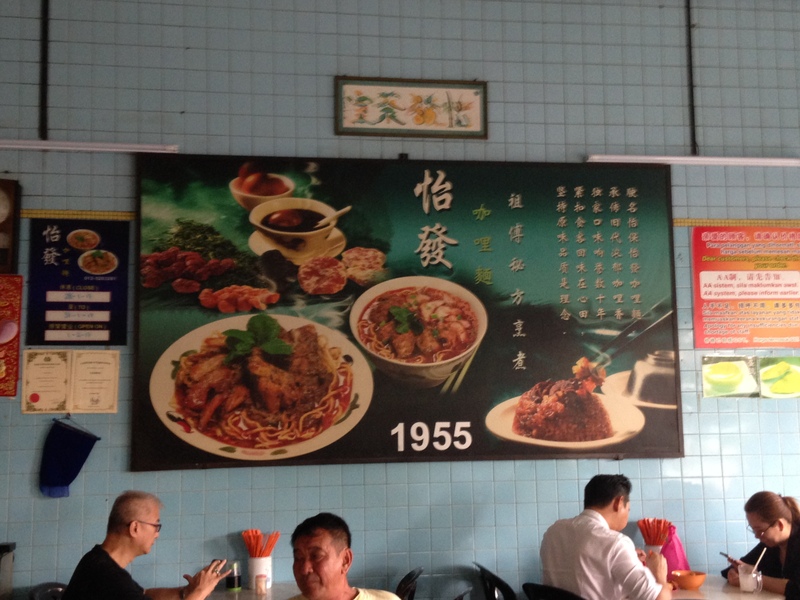 How many small eating places do you know that have been going since 1955? 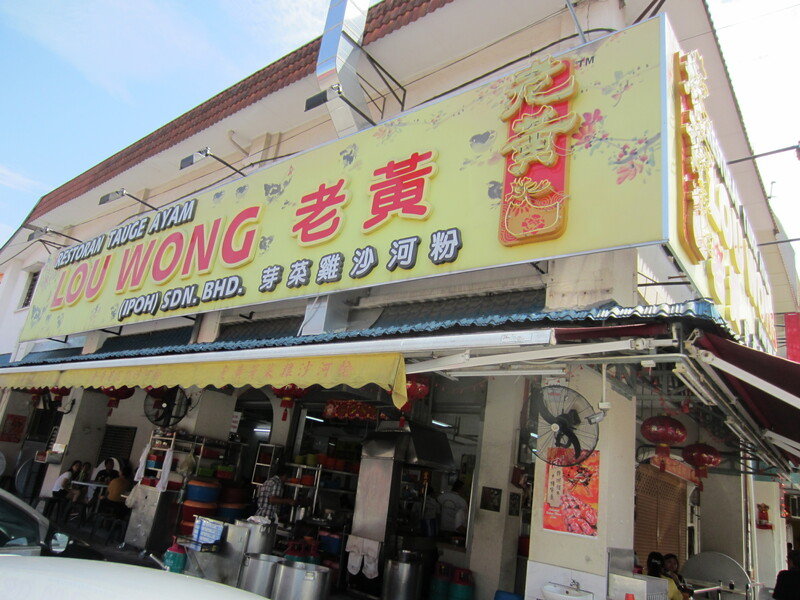 Non-Malaysians may also find it amazing that Yee Fatt sells only two dishes: curry noodles and glutinous rice with pork (the mound on the bottom-right in the second photograph above). The curry noodles come in two versions: either dry – with noodles on a plate and spoonfuls of curry sauce heaped over – or wet, where the noodles are dunked in a bowl with curry soup. If you like, you can order extra bean sprouts and pieces of deep-fried bean curd as accompaniments. I love Yee Fatt’s noodles – soft but not over-cooked – which I guess would be called al dente in the West. Also, their bean sprouts are perfectly crunchy. 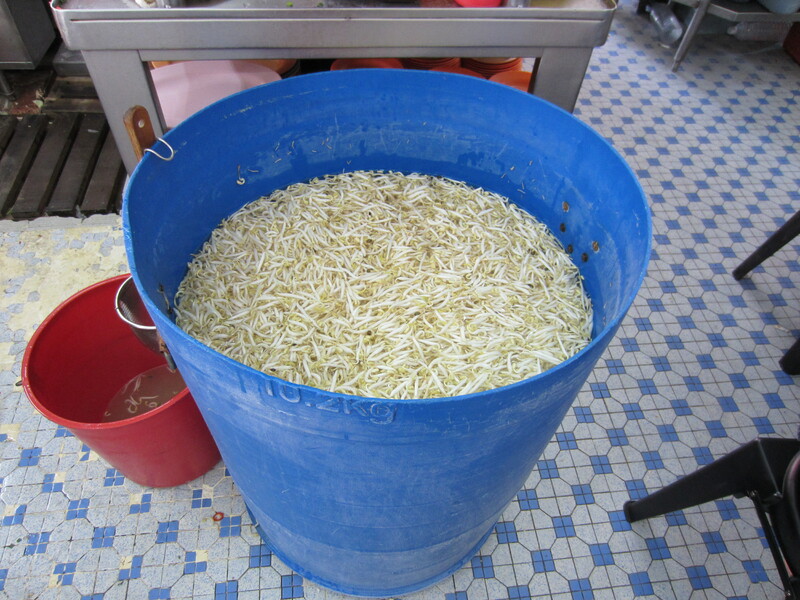 Of course, it helps that they use Ipoh’s bean sprouts, which I think are the best in the world. I’ve told this to the Guardian newspaper, National Geographic Traveller UK and anyone who cares to listen! 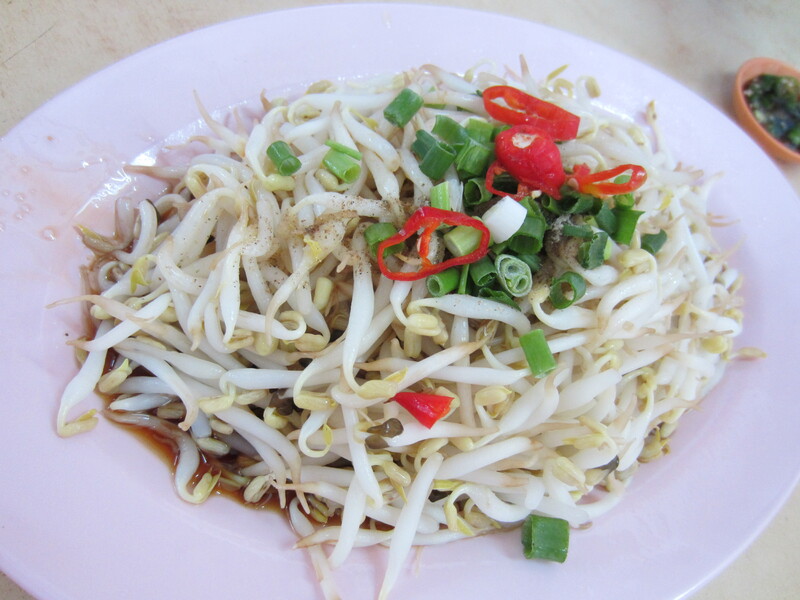 I can just imagine a celebrity chef like Anthony Bourdain declaiming the contrasts in this dish: the crunchiness of Ipoh‘s bean sprouts against the softness of just-right noodles. Smeared on top of it all is Yee Fatt’s irresistible curry sauce. I’m salivating as I write this and groaning a little too, since I won’t be having a bite anytime soon. Where, you may ask, does wealth come into the picture? Let’s just say that the boss, who looks as unassuming as his coffee shop, is said to be doing very well. I know you wouldn’t think this by looking at the photos. From a Malaysian perspective, however, the shop’s modest décor is actually comforting. It tells us that the food must be good – you certainly aren’t going for anything else. By keeping overheads low, the boss is making sure that he’ll be serving the town lots more curry noodles. The man at the Yee Fatt coffee shop is not the only food hawker who has done well; there are others like him. Their success, though, may be peculiar to Malaysia, where people care more about taste than décor and will drive miles through pouring rain for a hawker’s food. Readers love asking me how much of my stories are fact and how much fiction. One answer is that the historical events are real, but the characters are made up. Chye Hoon in The Woman Who Breathed Two Worlds was inspired by my own great-grandmother, who I never met. I know, though, that she earned a successful living as a food hawker, enough to send one of her sons to Britain for further education. So I can assure doubting readers that it’s possible for a food vendor in Malaysia to do this: it happened in my own family. In less than four weeks my second novel, When the Future Comes Too Soon, will be published! And I can tell you that publication is as exciting a prospect the second time round, and in some ways even more challenging! 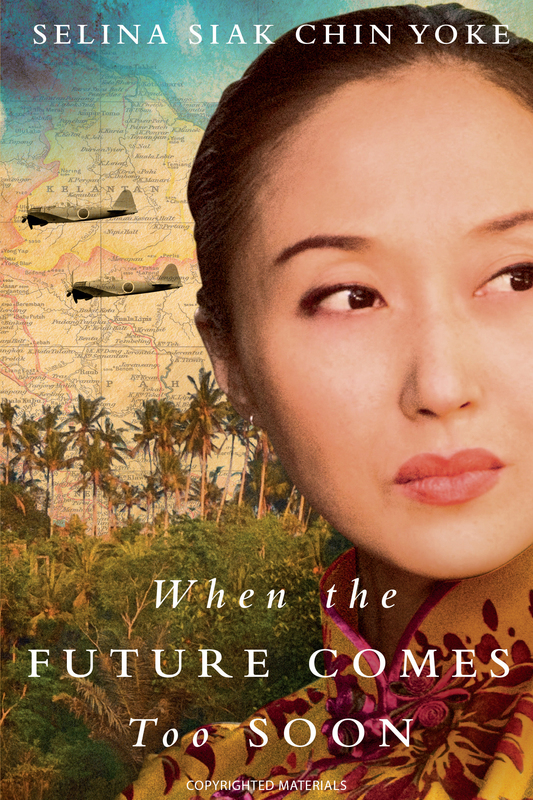 When the Future Comes Too Soon is set during the Japanese occupation of British Malaya and continues where my debut novel, The Woman Who Breathed Two Worlds, left off. Like the first book, this sequel is fictional. No character is real. But since the characters reflect ordinary Malayans, they go through experiences that many in the country would have gone through. This was my intent: to show what happened through the eyes of an Asian family. You may think that things are easier for an author on her second book. Believe it or not, they aren’t! On a debut novel no one knows what to expect, but I now feel the burden of expectations. I want readers to love this second book as much as they loved the first, and am terrified they may not. Secondly, because I have publicists on both sides of the Atlantic working to promote When the Future Comes Too Soon, I’m busier than ever. The more publicity that JKS Communications and Midas PR generate, the more work I have to do! In case you’re wondering how this works, here’s the two-sentence elevator summary. The job of book publicists is to promote books, and they do this by speaking to journalists and media editors in order to land people like me – the authors whom they represent – media slots: in newspapers and magazines, on radio shows and TV programmes, and on blogs. Each slot they succeed in getting me requires preparation, in some cases many hours of work (for instance, when I’m invited to contribute articles). I’m not complaining: this is a great problem to have! But the juggling that’s required is not that different to what I had to do in the business world. At present, while promoting this second novel I’m continuing to promote the first novel and to write the third novel at the same time. Between all of that and trying to retain some sanity, there are simply not enough hours in a day! For me, When the Future Comes Too Soon was an emotionally charged work. Like many Malaysians, when I was growing up I heard a lot about the Japanese occupation. Each time my maternal grandmother visited us, I would pester her to tell me more stories. I somehow had a sense of unfinished business, that what happened during the war has lingered and we in Malaysia have still not fully come to terms with the wounds. I felt this even more intensely while writing When the Future Comes Too Soon. It’s a book that means a huge amount to me, and I really hope you’ll like it. You’ve already seen the book’s front cover; below I share its back cover, too. 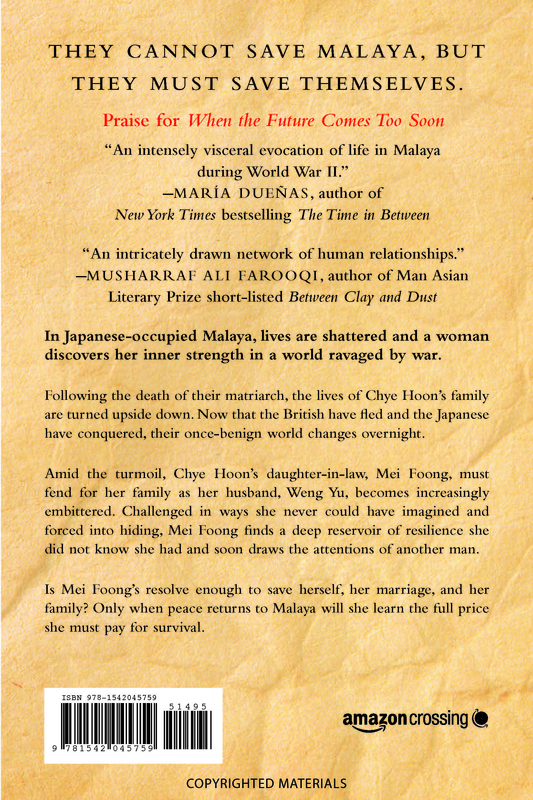 The Woman Who Breathed Two Worlds is the first book in The Malayan Series, but if you haven’t read it yet, don’t worry! Although When the Future Comes Too Soon is the second book in the same series, it can be read on its own. This was exactly what the two prominent authors who praised the book did. Maria Duenas and Musharraf Ali Farooqi read this second book without reading the first and had no trouble following the story. In less than four weeks, you can read When the Future Comes Too Soon! Meanwhile, if you’re a Goodreads subscriber, please add the book to your To Read shelf. Your feedback after reading the book – thoughts and feelings, questions raised – would all be very welcome! Needless to say your review, whether on Amazon or Goodreads or even your blog, if you have one, would be very much appreciated.